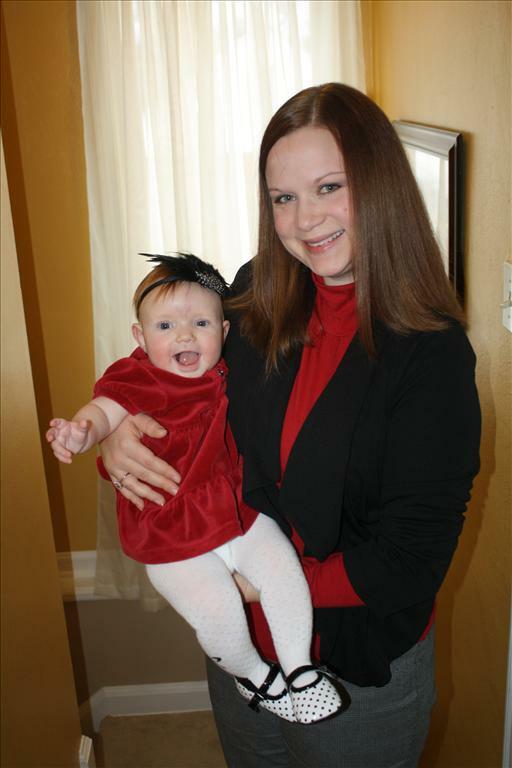 Mom and Charlotte getting ready for church during Advent. I recently read the blog post “Dear Parents With Young Children in Church”, about how bringing small children to church may seem like it’s a big hassle to parents and parents may think the kids are bothering others, but that parents should keep bringing those kiddos because they bring “joyful noise” to the sanctuary, etc. With a six-month-old, I’m pretty new to this whole taking a child to church thing. I’ll be honest, I’m still pretty new to consistently attending church. Up until about a year ago, you could count me under the Easter and Christmas churchgoer category. But, my husband and I finally found a good church home and attend (fairly) regularly. Anyway… I didn’t think much of this article immediately, other than – “Hey, thanks! I won’t worry about bothering other people anymore.” Our church offers child care during services, but Charlotte is so little that she usually doesn’t cause too much of a scene. So, we keep her with us in the pew. We hold her while she’s awake and leave her in her carseat if she’s sleeping. The real meaning of this blog post did finally hit me full force just during Advent, though. Charlotte enjoys the ceiling fans, stained glass windows and music of church, but usually doesn’t participate too much. But, lately, she’s been a bit more vocal. On this particular Sunday, we were late getting to church and sat toward the back. Charlotte spent much of the time chewing on Sophie the Giraffe and whipping the toy back and forth in the air. But, at some point she started her adorable chattering. Chattering turned into what I like to call “baby yelling”. It, in my opinion, was really cute and only somewhat distracting, but I must admit I was nervous about what the people around us where thinking. The sermon that day touched on Mary’s being betrothed to Joseph and pregnant with Jesus, yada yada yada – you know the story. There was even a funny sermon joke I had to giggle at – “I wonder how many gals turned Gabriel down before he came to Mary”. Ha. So, we continued to listen to the sermon and sing the hymns as Miss Charlotte sang a hymn of her own. I was beginning to think no one had noticed our adorable little songstress until after the service ended. The woman (Christmas-appropriate, as her name was Carol) in front of us turned around as we were all preparing to leave and said “You just have the sweetest little baby ever. Here I was hearing about the miracle of life and bringing life into the world from the pastor, and I kept hearing her behind me. It just all rang true – that this is what life is all about.” How touched, I was, by this stranger’s kind words. It really started the Christmas season off on a warm and fuzzy note. Yes – this is what our life is all about these days – our precious little baby. And, I’m sure Mary and Joseph felt the same pride for their baby boy. What an amazing blessing babies are! Snuggling with Dad after Christmas Eve service. We saw the blessing of babies in church even more brightly on Christmas Eve. Due to some scheduling conflicts, we decided to remain in town for Christmas Eve and do our thing as a little family of three. This included going to the 5 p.m. Christmas Eve service. This, of course, was the service ALL of the families with small children attended. You’ve got to get those kiddos to bed before Santa comes, you know? The church was dimmed with candles (REAL candles) up and down the outside of the pews. Everyone was packed in tightly and there were noises of all types – squeaks, squeals, giggles, etc. The Christmas story was told through photos and artwork done by the kids in the church, presented on a big screen. The choir wasn’t at this early service, but everyone sang our favorite Christmas hymns. It was a very special way to celebrate Char’s first Christmas. And, while she chattered away and drooled on her outfit, we saw a precious gesture. She reached forward to the pew in front of us and put her little hand on the hand of the two-year-old in that pew. They sat smiling at each other with Charlotte’s hand on top of her new friend’s for a few minutes. It brought a tear to my eye. Our children teach us so many things. 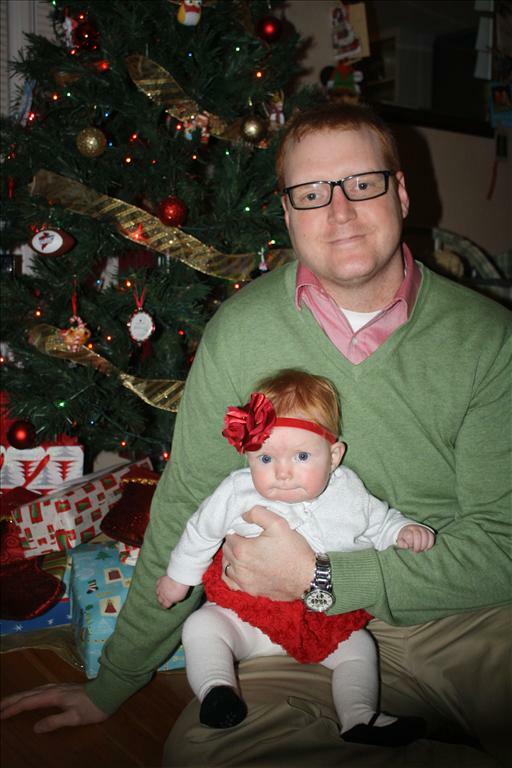 Charlotte got the meaning of Christmas at the age of six months – embracing a stranger and showing her compassion. I hope her lesson lives on through me. And, someday I’ll share this story with her, with the wonderful lesson that comes with it. Have a great start to your New Year! Resolve to embrace those around you and show compassion. Beautiful story… Really enjoying your blog! Thanks, Glenn. It’s hard to find time to write though with all of the snuggling I have to do. Ha!